Here is another great opportunity for the jobinassam readers. 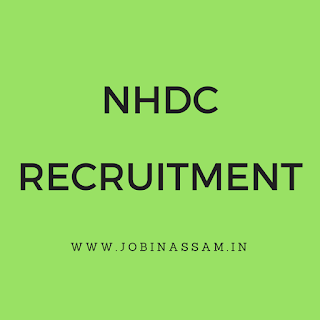 www.jobinassam.in has bring NHDC Recruitment 2017 news for you. NHDC Limited has published a notification for the recruitment for various vacancies. Eligible candidates may apply online on or before 21-08-2017. Other details like age, educational qualification, selection process & how to apply are given below. National Handloom Development Corporation Limited invites applications from the eligible candidates to recruit in the following posts. You can view the details of eligibility criteria and other important things below. Require Age- Not Exceeding 48 years. Degree in Textile Technology / Textiles Engineering from a University recognized by university Grants Commission or All India Council of Technical Education. Require Age- Not exceeding 45 years. 1. Degree in Law with specialization in Corporate Laws OR CA/ICWA/MBA will be an added advantage. 2. Working knowledge of computer like MS Office, Accounting Packages, Usage of Internet etc. will be preferred. Chartered Accountant from the Institute of Chartered Accountants of India / Cost Accountant from the Institute of Cost Accountants of India / MBA with specialization in Finance (Full Time 02 years) from a University recognized by University Grants Commission/Institution recognized by AICTE. Post Graduate in English with Hindi as a subject in Graduation level OR Post Graduate in Hindi with English as subject at Graduation level. Master of Business Administration (Full Time 02 years) with specialization in Personnel Management OR HR/ Master of Industrial Relations & Personnel Management / Master of Personnel Management / Master of Social Work (MSW) from a University recognized by University Grants Commission. These posts are advertised by www.nhdc.org.in to recruit eligible candidates for their department. You can apply for the post if you have the eligibility mentioned above. 1. Please read the detailed advertisement and all the instructions carefully before filling the online application form. 2. Applicants are advised not to wait till the last date and time to submit their applications. 3. Applicants meeting the requirements notified may submit their application through online from 04th August 2017 to 21st August 2017 and the facility can be accessed through our website www.nhdc.org.in (Career Page). 4. Applicants are required to ensure that all certificates towards caste certificate, proof of age, qualification, experience, self signature scan document and a recent passport size colour photograph are ready for uploading before commencement of the online application process. Application submitted direct or by any other mode will not be accepted. 5. Applicants should have a valid E-mail ID and Mobile number. It should be kept active during the entire recruitment process. All important communication will be sent on the registered E-mail ID only. ii. Scanned copy of signature on white paper with Black Ink pen in jpg/png format with maximum size upto 01MB. iii. Scanned copy of caste certificate, each educational qualification & experience/service document in jpg/pdf/png format with maximum size of 01MB per document. I have shared all the important knowledge for the upcoming NHDC Recruitment here. This is completely free service from me. NHDC will be a good job for you if you are eligible for the post mentioned above, apply before the last date. Moreover, monthly pay for the NHDC job in Assam is also good.